These crowd barriers with black and red belt guides visitors effortlessly through any venue. 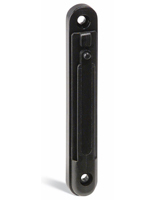 Control lines with these beautiful 7.5' barricades. 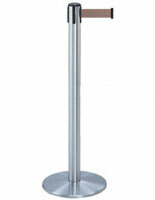 These barriers with black and red belt, also known as retractable stanchions, feature polished chrome. 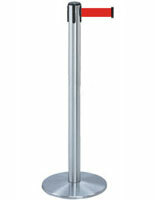 This stanchion system post measures 38"H with a 13.5"D base. 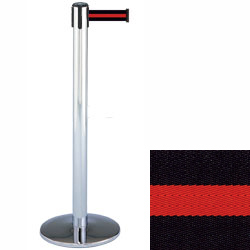 These crowd barriers with black and red belt that is 2" wide weighs 24 lbs. in total. 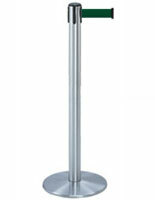 From the exclusive Tenasabarrier line, these systems are your go-to for queuing lines at events. For your higher traffic areas, we recommend using Dual Belt Posts. 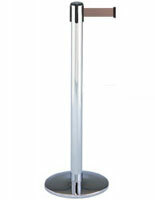 These barriers are great for discouraging people from ducking under and from having kids run underneath.